A filter’s purpose is to clean. In an aquarium, it’s responsible for removing physical and soluble chemical wastes from your water. But what is a hob filter? A new aquarium hobbyist may not be sure what it means and how it differs from other filters. If you try to look for the dictionary definition of the word “hob”, you’ll probably find it difficult to relate the word to aquariums or even filters. That’s because this word is not really related to it. In fact, for aquarists, “hob” is actually just an acronym standing for Hang On Back, which means a filter that is simply hanging on the back of your aquarium. What Are Your Options? 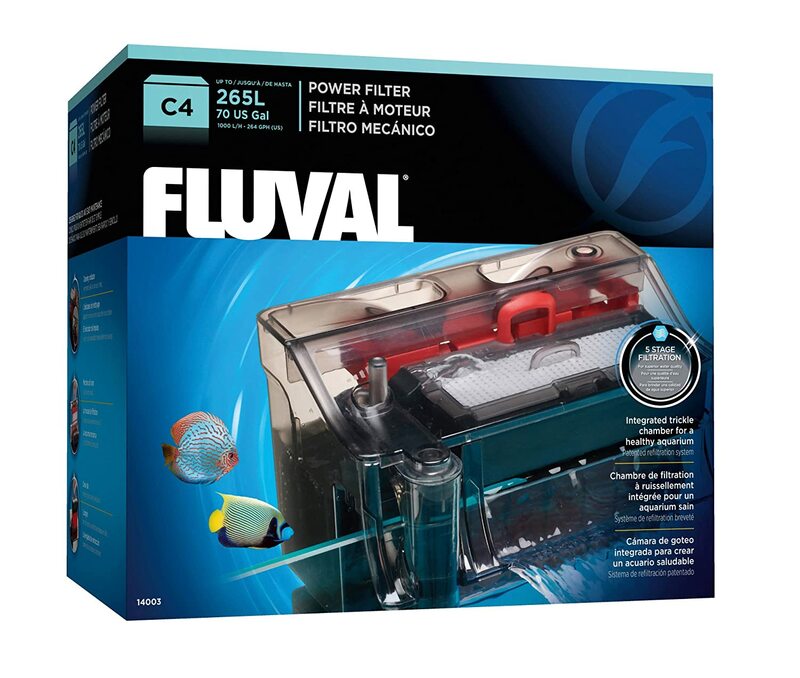 Fluval C Power FilterAquaClear Power FilterAPI SuperClean Power FilterPenn Plax Cascade Hang-On Aquarium FilterMarina Power FilterWhat’s The Verdict? Why Should You Get A Hob Filter? There are a lot of benefits in getting a hob filter. Due to the fact that it’s just hanging on the back of your tank, it’s easily accessible so maintenance would not be too difficult. You can also quickly replace or remove the filter media. Hob filters are also generally inexpensive, and provide great filtration as well. Because of the improvements in technology, most of the hob filters in today’s market make very little noise compared to their earlier versions. This makes them ideal for aquariums that are placed inside the bedroom. When buying equipment for an aquarium, you need to think of various things. What type of product should you buy? Is this product better than other products? When deciding on a hob filter, it’s important to take the size of your aquarium into consideration. If you have a big aquarium, a higher flow rate might be necessary to reduce the time needed for filtration. Similarly, a smaller aquarium or a nano reef tank may only require a hob filter with minimal capacity. Most hob filters indicate the amount of water they are capable of filtering. There are also brands that offer the same product, but in different sizes, to accommodate various amounts of water. Some are good enough for just 5 gallons, while some can filter up to 300 gallons. There are different types of filter media that you can use. While you can choose the kind of media you want, depending on the types of fish and plants living in your aquarium, many hob filters already come with their own filter media. It’s quite common to find filters that are equipped with one or all of the three types of media: mechanical, chemical and biological. If you have a certain preference, then you should take that into consideration when choosing your hob filter. Having to clean and maintain your filter is a given. However, different models of hob filters may have various methods for cleaning and maintenance. For filters that have more filtration media than others, they may require a more thorough cleaning process. Choose the type of filter that is easier to clean if you don’t have enough time for maintenance. Most hob filters provide instructions on how to maintain the devices, so you should consider this factor before purchasing one. These three are the most important things that are specific to the hob filter. It might be difficult to decide on which hob filter suits your aquarium best. To help you, we've rounded up 5 top-rated products for you to choose from. The products have a vast range of gallons per hour (GPH), as well as different filtration media to suit your preference. This powerful filter comes in three types: C2, C3, and C4. Each type can accommodate different aquarium capacities. The C2 is suitable for 10 to 30 gallons; the C3 can filter from 20 up to 50 gallons; and lastly, the C4 can handle 40 to 70 gallons. In terms of efficiency, the C2 model can filter up to 119 gallons per hour (GPH). The C3, on the other hand, is capable of filtering up to 153 GPH. Being the highest-capacity one, the C4 model can filter a maximum of 264 GPH. It offers a 5-stage filtration system that is composed of mechanical, chemical and biological filter medias. The combination offers a thorough filtration of your water. Extensive 5-stage filtration system that produces crystal clear water. Suitable for tanks of different sizes. Easy maintenance: the impeller cover only needs to be cleaned once a year, and the motor should only be cleaned every 3 months. It's also equipped with a cleaning indicator for when the poly foam needs to be rinsed. Not very quiet and is probably not ideal to use on an aquarium in the bedroom. More expensive compared to other brands, but you might want to consider the 5-stage filtration system that it offers. Due to its 5-stage filtration system, there are more filter media for you to replace (foam needs to be replaced every 4-6 weeks; half the quantity of C-nodes must be replaced every 6 months; 2-4 weeks for activated carbon; 2-3 weeks for bio-screen). This easy-to-install filter comes in 5 different models that can handle various tank capacities. The first model is meant for aquariums with up to 20 gallons. Up next is the model that can handle up to 30 gallons, while the third one has the capacity of up to 50 gallons. The fourth one is good for up to 70 gallon aquarium. And the last one can accommodate up to 110 gallons. Their filtration outputs vary as well, at 80, 100, 150, 200, and 300 GPH respectively. The models come with a 3-stage filtration system, which involves an AquaClear Foam that removes debris and provides optimal water distribution patterns; an AquaClear Activated Carbon Insert, which gets rid of odor and discoloration; and AquaClear BioMax ceramic rings that allow good bacteria to thrive. Has a wide range of aquariums for different sizes. Comes with a 3-stage filtration system, which may cost less when it comes to replacing filter media (foam can be replaced every 2 months; activated carbon should be replaced every month; BioMax ceramic rings can be replaced every 3 months). Does not make much noise. Requires a more extensive maintenance process: the filter has to be cleaned every two weeks. It is also quite expensive compared to other brands. This affordable filter is great for small aquariums containing up to 20 gallons. With its quiet, leak-free design and advanced cartridge technology, this filter is capable of making your water (and even your gravel) clean and crystal clear. It comes with a Bio-chem Zorb cartridge that provides a complete range of filtration media. You can also add more filter media if you want. At just 1.9 pounds, this filter is small yet highly durable(1). With an adjustable flow rate, it's a good option for hobbyists who keep betta fish or other aquarium species that aren't too fond of strong currents. Especially made for smaller tanks so it’s a great option for aquarium hobbyists who keep only a small tank or fish who prefer little current. May not be an option for those who have tanks with more than 20 gallons. It can be difficult to find replacement filter cartridges such as nitra zorb and phos zorb. This hob filter can deliver 300 GPH for aquariums from 55 to 100 gallons in size. It has an efficient quad-filtration system with an internal sponge that allows colonization of anaerobic bacteria. These can aid in the removal of ammonia and nitrite. An active carbon cartridge is also included, which helps in removing harmful chemicals, contaminants, odors, and toxins from your aquarium. There is also a polyfiber floss cartridge that traps floating particles. Recommended for both freshwater and saltwater aquariums, this hob filter has an adjustable flow knob that lets you adjust filtration as needed. 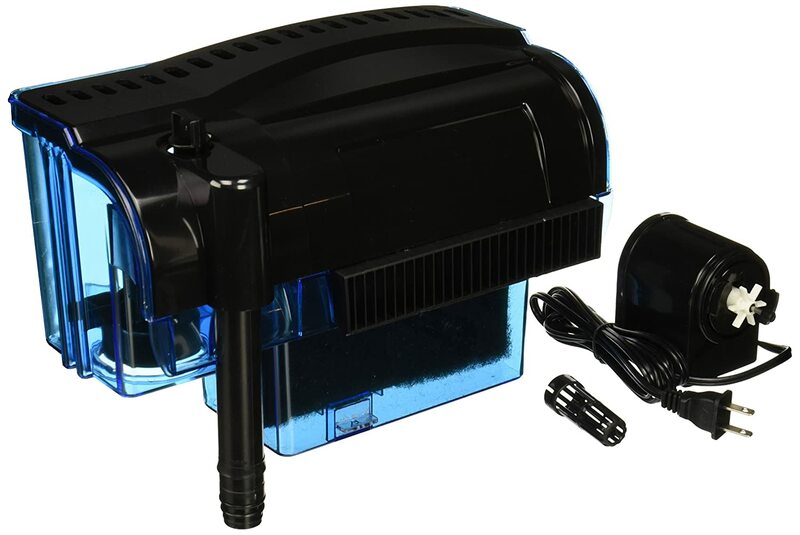 Comes with a quad-filtration system that ensures a thorough cleaning of your aquarium’s water. Warranty is available but for an unknown duration. It is only offered in a single size, which is good for tanks from 55 to 100 gallons in size; quite a limited range compared to others. Due to the quad-filtration system, it may be costly to replace all of the filter media. This slim hob filter has a unique and compact design that reduces the needed space on the back of your aquarium. 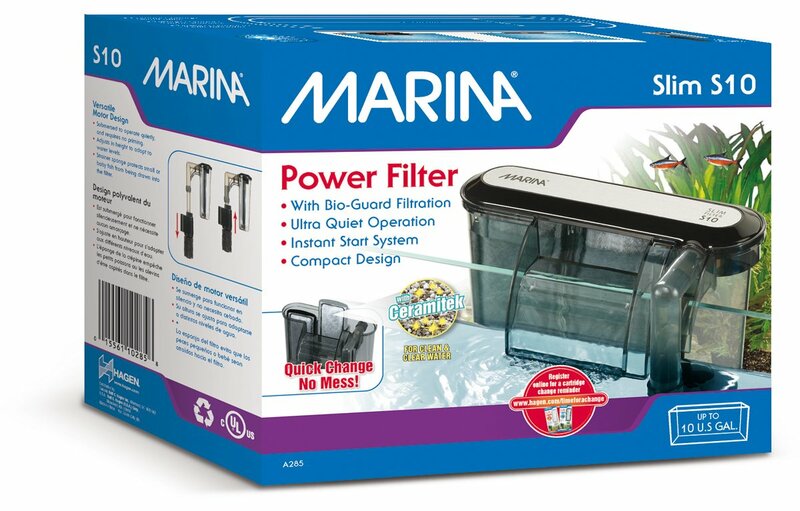 Compared to other filters, which may look bulky, the Marina Power Filter is a nice fit to a small aquarium. It comes in three models that can accommodate up to 10, 15, and 20 gallons respectively. All models are inexpensive and costs less than $20, however, shipping fee does not apply. With its adjustable flow control, setting it up is easy and does not require any priming. It also includes two filter cartridges: a Bio-Carb and a Bio-Clear, which both contain Ceramitek. This is engineered to optimize a biological filtration. Slim and unique design that makes it take up less of the space. Includes two filter cartridges and may be more affordable to replace. The filter itself is less than $20 regardless of the size you choose. Self-priming; easy to set up and maintain. Limited sizes available; the maximum it can handle is up to 20 gallons only, unlike other brands that have models for up to 100 gallons. It’s mostly focused on biological filtration, however, you can customize this if you want to add mechanical and chemical filtration as well. Our top pick would have to be the AquaClear Power Filter. 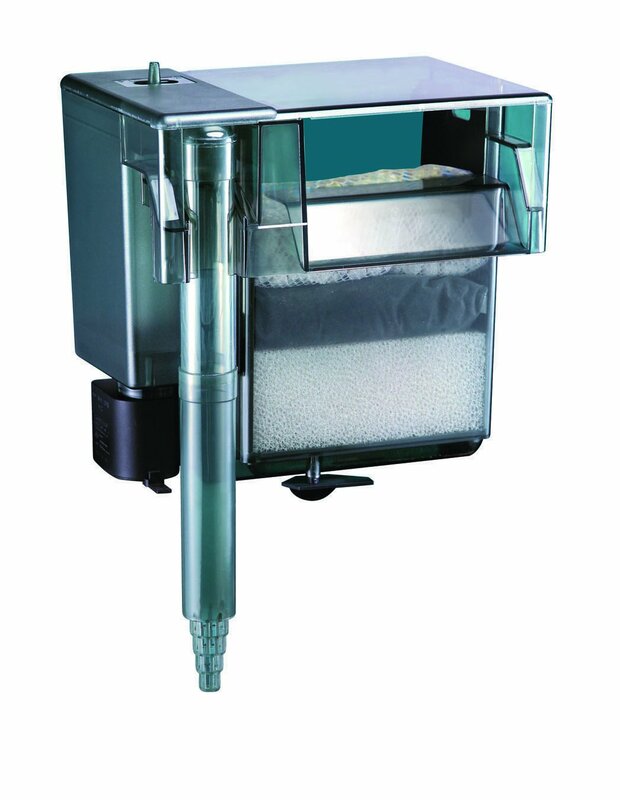 Not only is it available in multiple sizes, it also offers a 3-stage filtration system that involves all three different kinds of filter media: mechanical, chemical and biological. The manufacturers also provide easy-to-follow instructions on the hob filter’s maintenance and the replacement procedure for each filter media. Not to mention, they offer a 2-year warranty. All of these are also offered by the Fluval C Power Filter. In fact, this one even has a 5-stage filtration system, which may be more intensive compared to AquaClear’s. However, it can be quite expensive to maintain and replace all of its filter media. It’s still a pretty good choice for those who have an extra budget and prefers a more extensive filtration process. 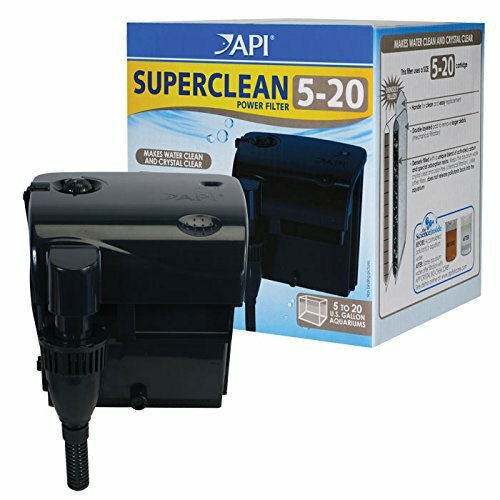 For those who prefer an inexpensive option, or those who don’t really need a powerful high-capacity hob filter, the API SuperClean Power Filter is a great option as well. Overall, all of these products have their individual strengths and weaknesses, so carefully measure them up to your particular needs and wants for your own aquarium. What about you? What’s your pick? Tell us in the comments section below!